Wow so far I have been accepted into two exhibitions in March and April, one in Castlemaine and the other one in Melbourne. Also I have been invited to participate in a wearable art show later in the year with further details to follow. 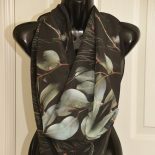 This entry was posted on January 24, 2019 by sharongreenaway in #sharongreenaway and tagged artist, bendigo flora, exhibitions, invited to attend, sharon greenaway art, wearable art.